The Asian Hercules arrives in Peterhead for foundation delivery. Picture by Gordon Morrison. 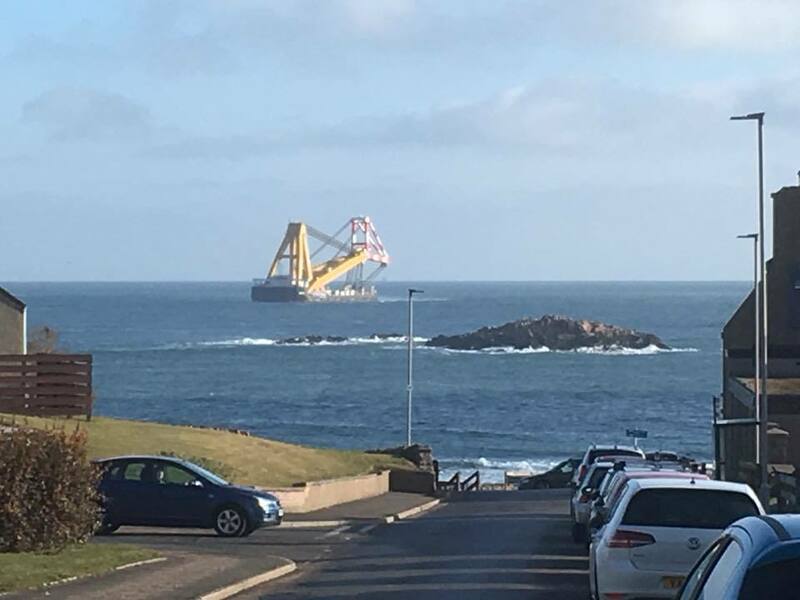 The giant Asian Hercules III has been spotted coming into Peterhead Port today to wait for the Aberdeen Offshore Wind Farm foundations after their arrival was delayed by ‘the beast from the east’. The 77 meter-high, 1,800 tonne steel jacket foundations are currently in Dundee after making their way by barge from Newcastle. Vattenfall, the project’s Swedish operators, confirmed that the delay was due to last week’s disruptive weather. The Asian Hercules and the foundations’ arrival had to be rescheduled, delaying the delivery to Peterhead and the subsequent dispatch to the site, 1.5 miles off the Aberdeen coast. The 25,000 tonne Asian Hercules III, one of the world’s biggest floating cranes, will be used to lift and install the huge steel jacket foundations – each as heavy as ten Boeing 747s. The crane will lower the 11 foundations onto the seabed at Aberdeen Bay Wind Farm upon their arrival from Dundee over the next week.